A payment gateway is an online software and it’s a CRUCIAL part of the processing payments online. In fact, it’s essential for the online transaction to take place. So today, I’m gonna tell you what payment gateway is, AND it’s relationship between your company store (online or off) and the merchant account. And since I’m always mindful of practical application, I’ll show you a 3 payment scenarios on how to use it. There’s a number of different ways to utilize a payment gateway in your business and it will depend on the credit card processing software (or in some cases the hardware) that you’re using. First off, there are 3 these things related to a Payment Gateway, that are often confused that I want to clarify. Understanding the the relationship between them can help shed some light on the payment gateway’s function. So let’s establish that a payment gateway (a.k.a. 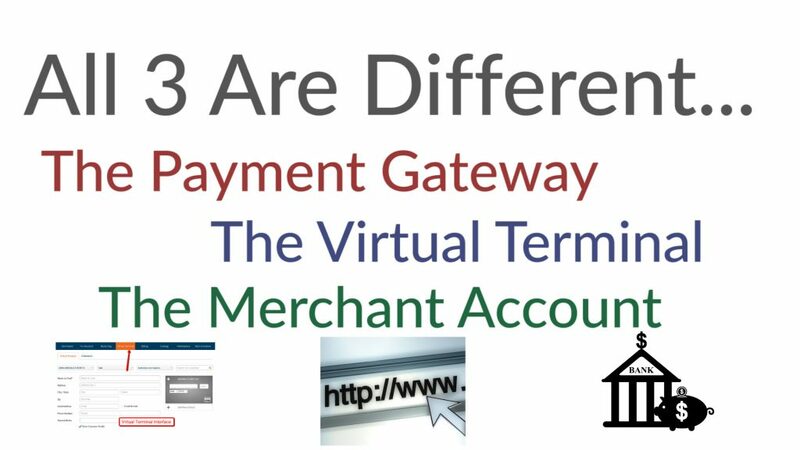 a merchant gateway, or an online gateway) is NOT a merchant account. A payment gateway is the software (most often used in an online processing environment) that connects checkout software to a merchant account. A Merchant account is a dedicated bank account that is used to deposit money that results from a credit card transactions. 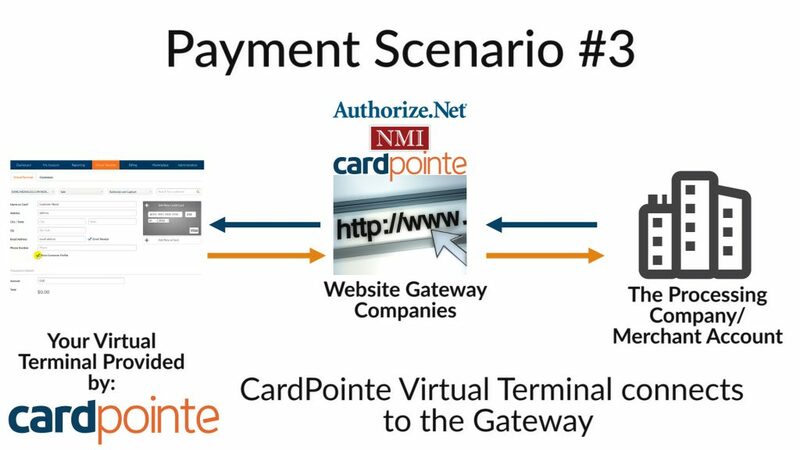 A virtual terminal is an option that connects to the payment gateway giving you the ability to log in to a website portal and process transactions. Virtual Terminal is also slightly different than a payment gateway… the 3 often work hand in hand but they’re all different and serve different functions. First off, let’s answer the question of what does the payment gateway do? Well, it serves the purpose of securely passing sensitive cardholder data to the credit card processor from a point of sale device or software. .
#2 that data is then captured, encrypted and sent through the payment gateway to the processing company and then back again to the Point of sale device once the response is generated. 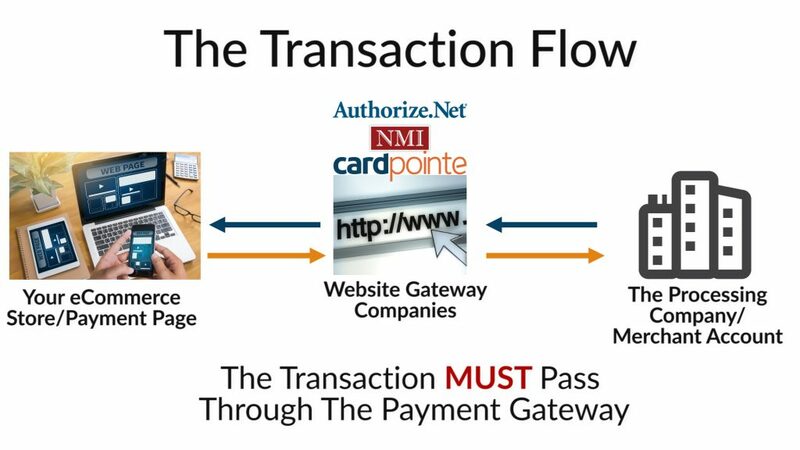 So the payment gateway is essential to complete an online transaction. Now, there’s more pieces to the entire transaction flow, but this video is solely focused on the gateway itself, so this is a simple version of the entire transaction flow. All of this happens in just a matter of seconds so the gateway often serves as the workhorse behind closed doors. Your customer never sees it and you don’t see it either… But it’s there, keeping sensitive data safe and making sure transaction processes flows smoothly. Think of the gateway as a connector between the software your business is using on your website or point of sale system, and the processing bank. The ways to use a payment gateway depends on the nature of your business and how you interact with your customers. This all starts with identifying what software do you use or your processing environment… in other words, how do you accept the credit card from your customer. We’re gonna go over 3 workflow and payment scenarios here to illustrate the payment gateway’s role in the transaction process. WordPress is the framework of the website. WooCommerce is a “plugin” that is used to create the eCommerce environment. It allows you to set up product pages and payment pages, and categorize them as you would like, so you can have your online store! WooCommerce in this case is the software that will determine which payment gateway you’re able to use. There are 100’s of gateway services that can be used so in this example WooCommerce has listed the the gateways that work with their software, on their website. I don’t think this is a comprehensive list, these are just the ones that they provide support with. There are other gateways out there that have built plugins that connect to WooCommerce that are not shown on this list. So after your payment gateway is connected to WooCommerce, and a purchase is made, the gateway sends the encrypted data over to the processor for authorization and then back again to your eCommerce store. So this workflow, the customer (and your payment gateway) is doing all the work. They enter their credit card number on your site and the rest of the transaction flow is automated up to the point of you fulfilling the product order. Your website is always there, always offering your products for sale. The payment gateway is always live ready to do it’s job when an order is placed. Workflow 2 – Using a payment page or form builder software like Simplypay.me, Wufoo or Formstack. These are all subscription software tools and in this case, these services allow for you to create forms and payment links so you can receive payments for your products and services. They don’t have to be attached to your website so these can be stand alone hosted payment links that you can email to your customers (or place links on your website). So here’s a sample form from Wufoo.com, and behind this form, connected within the administrative dashboard is the Payment Gateway connection. Again, the software that you’re using determines the payment gateway that you can use. 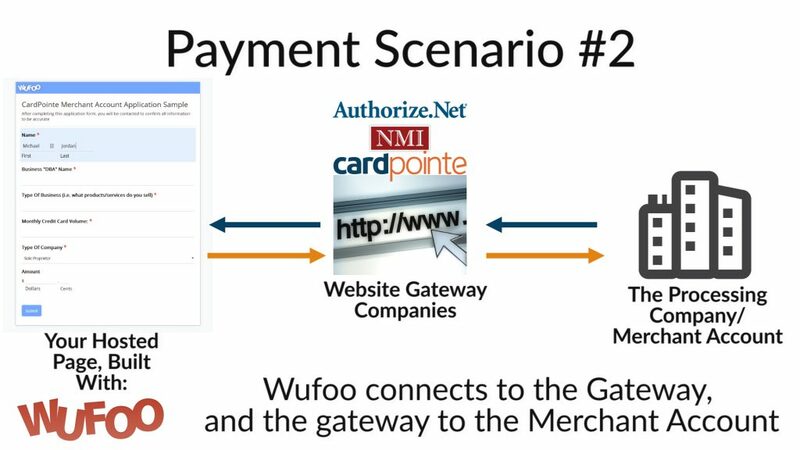 So, if we look at Wufoo.com for this example you can see that there is a list of about 8 gateways or Payment Service Providers that integrate with Wufoo. Workflow 3 – Using a Virtual Terminal in a call center environment. A payment gateway account, is almost always going to have the option to add a virtual terminal. The virtual terminal is NOT a consumer facing environment so that just means that you and your company staff will see the virtual terminal and type a credit card directly into it the virtual terminal entry fields. So in this case you have your virtual terminal and your staff perhaps that is entering payment information into the virtual terminal. So once the payment is entered and set to process, the gateway goes to work to complete the transaction cycle and processes the payment. So a gateway is required for these 3 services, because none of them are Payment gateways themselves and therefore don’t have direct connections to the payment processors. So that is just 3 scenarios of how to use a payment gateway in your business. There are literally thousands of different possibilities to use payment gateways, merchant accounts and software tools so check the links in the description and the other videos on this channel for other and other payment gateway and software tool uses.